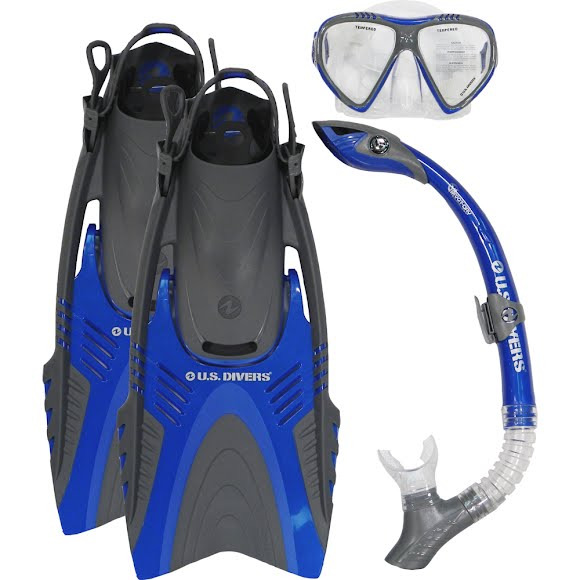 This Premium snorkeling set from US Divers features Pivot-Fit Technology, the result of many years of snorkeling and diving experience. The Pivot-Fit mask design provides the ultimate in function and comfort to ensure that your snorkeling adventures are as fun and comfortable as possible. 100% submersible dry top snorkel with Pivot Dry Technology. Pivot-Fit Technology is the result of many years of snorkeling and diving experience. The Pivot-Fit mask design provides the ultimate in function and comfort to ensure that your snorkeling adventures are as fun and comfortable as possible. Our Pivot-Fit buckle designs provides maximum adjustability and superior comfort. The pivoting buckles allow the mask to sit comfortably on the face while providing the user with the ability to fine tune the strap tension and positioning. The Pivot-Fit buckle designs include an incredibly easy-to-use &apos;Pinch and Pull&apos; buckle, as well as an very intuitive, 3-way Pivot-Fit buckle - both models designed to enhance your comfort and enjoyment of water exploration. To tighten the mask strap just pull end of the strap making sure to adjust each side evenly so that the center the back of the strap is centered on the back of your head. To loosen the strap just pinch the two buttons on the buckle and pull the strap away from the mask. The Pivot-Fit 3-way buckle can be loosened by pinching the 2 buttons on the buckle or by pulling up on the buckle tab. The pivoting buckle feature allows you to fine tune the strap positioning for maximum comfort. The patented design of our Pivot Dry snorkels feature a pivoting top that not only provides an excellent splash guard while on the surface, but it will also close and seal out water when you go under. Whether on the surface or under the water no water enters the snorkel, maintaining a dry and open breathing passage. Unlike most &apos;dry snorkels&apos; the unique design of the Pivot-Dry top also provides a large open tube for easy breathing while on the surface, yet it keeps all water out!